On Friday, January 25, Dell volunteers provided digital literacy training for older adults at the AGE Computer Lab for CTN’s monthly Tech Teach-In program. During the three-hour session, the 15 volunteers taught the basics of Microsoft Word and Excel to 15 learners. The skill level of the learners ranged from beginner to expert. Some people used Excel for their finances, Word when they wrote letters, and even one man who used the Microsoft suite to manage a small family trust. The volunteers were surprised at the diverse needs of the group and used their individual skill sets when mentoring one-on-one to be most effective in their teaching. 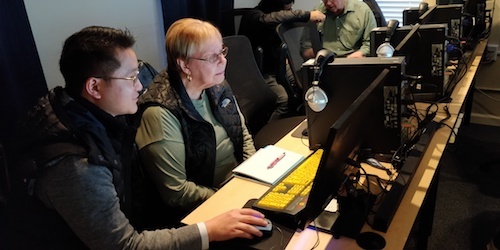 The AGE computer lab hopes that this teach-in will inspire seniors who are already taking classes at the lab to branch out and try more advanced lessons. For Tech Teach-In information in the Austin area, contact Jessica Looney at jessica@communitytechnetwork.org. For information in the Bay Area, contact Eric Babb at eric@communitytechnetwork.org.